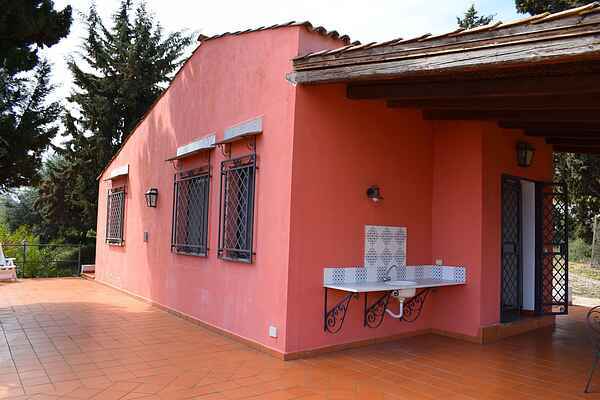 The little Pink House is an adorable cottage with a breathtakingly beautiful view on the Golf of Solunto, situated in the property of Villa Céfalà (at 200m with wonderful restaurant and swimmingpool) You can park right next to your house. The house enjoys a master bedroom, a livingroom with sofa/bed for 1 person, a kitchenette and a bathroom with wc, bidet, shower and basin. The house has airconditioning and tv and what is best, a wonderful terrace around it where you can enjoy all of your meals whith that beautiful view. Villa Céfalà rents out bycicles for those who care to explore the surroundings or to go to the beach. Also you can participate in the cookinglessons organised in the restaurant or go out for a fishing trip organised by the staff of the Villa. A regional train passes now and then which links the different places on the coast.